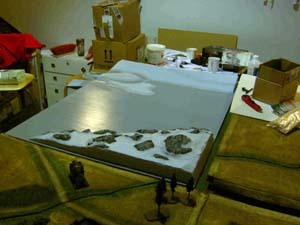 Instead of making the terrain from generic terrain pieces, each of the battles will have a custom built terrain trying to capture the landscape as exactly as possible but still keeping in mind the playability and durability because of the need for the pieces to be transported every now and then. 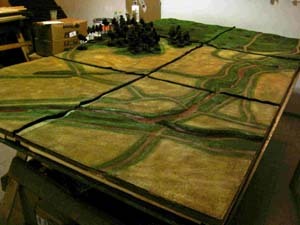 As the battlefields are quite large we divided each battlefield into six terrain sections to ease the handling of them. 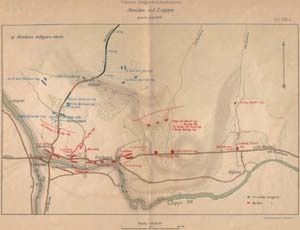 As old maps of the battle rarely have the wealth of information about the lay of the land we’ve added the current information, mainly the height levels, to the old maps and printed these the same size as the terrain to be built. Starting from the lowest level these maps are cut one level at a time and these cut-outs are traced to cardboard and cut out. These cardboard elevation levels are then glued to the hardboard base with PVA glue.We’ve also used a stapler to help the elevation levels stick better in their place before the glue starts to cure. The smaller last levels are easily and quickly attached to their place with the use of a largish hot glue gun. The hot glue cures very quickly and doesn’t constrict when doing so thus causing no warping. Unfortunately most of the elevation levels are so big that it isn’t possible to use hot glue for them since the glue cures quicker than one can apply it to the whole piece. Since the PVA takes quite a while to cure and even with stapling the cardboard pieces tend unfasten in some places we started using plenty of weights to keep them in place until the glue cures. This also helps lessening the warping which is caused by the PVA when it cures. Note that the boards will have to be on even surface when weights are placed on top of them and floor is the most natural choice. In our clubroom we have access to gargantuan amounts of printed material which, being quite heavy, is rather optimal for weighting the boards down. When there’s several levels in place a framework of small wooden planking is added to underneath the terrain sections. These should help prevent the warping later on by adding rigidity. Nevertheless the addition of new levels will warp the terrain sections unless weights are still used. Since the planking forms a frame the middle of the sections will sag underneath the weights so a small piece of loose planking is placed under the centre of each section while the weights are in place to prevent this. Since the frames are attached by screws you can’t leave attaching them to too late a stage as you won’t be able to fasten the screws if there are too many elevation levels on top of the hardboard. How the terrain sections fit next to one another is tested after all the elevation levels are in place. Excess material can be sanded off with a very rough sandpaper and additional material can be applied to the sides of the terrain sections if need be. There most certainly will be at least some gaps between the terrain sections and if these are overly big they can be masked by the addition of cloth strips. These cloth strips, roughly 3-4 inches wide are glued to the edge of the boards so that half of each is hanging out and as this will lay on top of the next board it’ll mask the possible big gap underneath (if it becomes wrinkled in use it is fastened to place with blue tack). With some boards that continue to warp no matter what you need these masking strips and sometimes you don’t. Anyways, whether these masking strips are used or not the elevation levels are now smoothed out with ready made filler and the parts of the masking strips attached to the terrain boards are also hidden underneath a layer of filler. To achieve a natural smoothly flowing look several layers will have to be used. After the filler has dried the board is textured. 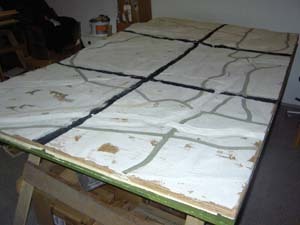 For this we decided to use sand as the terrain will be transported around and will have to be quite sturdy. First extremely fine sand is applied to roads. After this has dried fine or “normal” sand is applied to clear terrain such as fields. Finally rougher sand is used for woods. Sand is attached with PVA glue thinned down a bit with some water and some dark paint can also be thrown in to the mix. The rough patches will need another coating on top to better bind these to the surface. If cliffs are desired these areas are best left unsanded and some steep cliffs can also be made with cork or Woodland Scenics’ moulds etc. It is also possible to make some bare rocky areas by adding ready made filler on top of the sand and sculpting it to a desired shape. No glue or sand should be applied to the loose parts of the masking strip as this would make them too rigid. The free hanging part of the masking strip is just painted to corresponding colors of the rest of the terrain next to it. Finally the terrain is painted using acrylic paints of the house painting variety these being much cheaper than the modelling paints. First thing to do is to give the whole terrain a dark wash so that no lighter patches will be visible underneath the painted surface. We’ve traditionally used a very dark shade of brown for this which is heavily watered down -these acrylics can be diluted quite heavily whilst still retaining enough pigmentation to cover the area to be painted. After the wash has dried up the areas are painted as preferred by drybrushing. Adding several layers is a good thing as the paint also will help the sand stick in place so the more paint there is the better it will hold down the sand. If there’s any water areas on the terrain the last thing done is the addition of Woodland Scenics’ Realistic Water to these areas after the areas have been painted to appropriate shade. 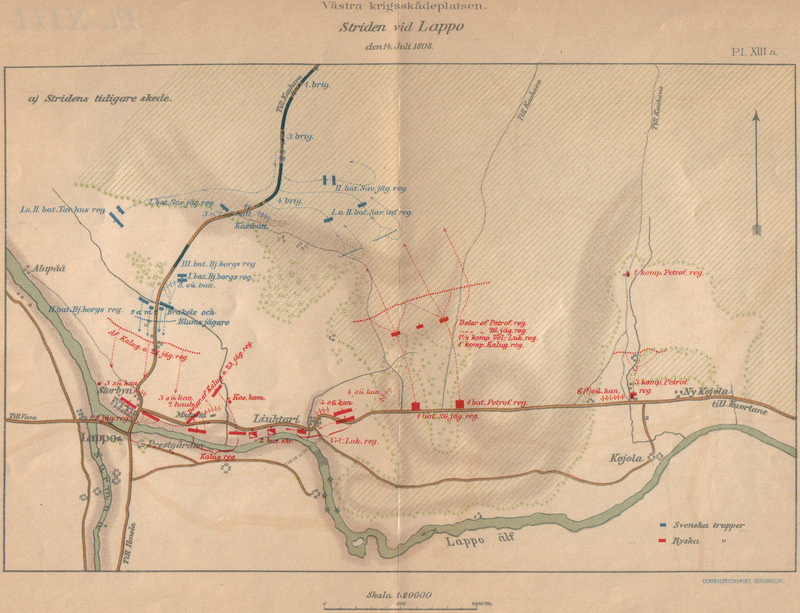 As two battles (Juutas and Leppävirta) were much smaller these were decided to be used as especially designated demo tables. Since this meant that they’d get transported more than the other terrain pieces and consisted only of one board each we decided to make them somewhat more sturdy. Therefore instead of using hardboard for the base we used 1 centimetre thick MDF which is not as prone to warping but not immunet to it either. We also built sturdy reinforced carrying cases for these boards from the same material and the actual terrain boards were used as the bottom parts of these cases. As Leppävirta took place during winter the terrain was flocked a bit differently. First the cliffsides (made with Woodland Scenics’ plaster molds) were painted and then the rest of the terrain was painted white and to the wet paint baking powder was applied. Originally we had envisioned to use white tinted with diffrent blues and greys to give the snow a bit more variation but we quickly noticed that baking powder most definately needs to be used with pure white to look convincing. The terrain has a winter road crossing the top of the frozen lake and to represent the trampled slushed snow it was painted by lightly dabbing ochres and light browns. Tiny clumps of Woodland Scenics Foliage was finally applied to the sides to represent the fir branches used to mark the road’s route so route could be distinguished even in blizzards. Trees for Leppävirta were made the usual way (Please check “modelling trees” to see how to make these) but since we didn’t need the winter trees to be usable with any other terrain boards we could leave the trees unbased and drilled suitable holes to the terrain board for them. Also after the trees were ready they were given a light “misting” of white spray to give them a wintery feel -we had experimented with christmas decoration sprays but found these to be much poorer alternative to a coating of regular white spray. We used only conifers as convincing wintery deciduous trees are a bit more time consuming to make. We also wanted to make the Juutas terrain look a bit more realistic than the other non-winter boards and instead of flocking it with sand we used the Wodland Scenics flocking method described in their cheap and exellent Scenery Manual (C1207).